In early June, when Michael Conforti became president of the Association of Art Museum Directors (AAMD), no one could have anticipated the challenges that he and his colleagues would face just a few months into his two-year term. Read Lee Rosenbaum on the WSJ here. The creator of an inflatable artwork ignored safety concerns and blocked its evacuation shortly before the walk-in structure broke free of its moorings and soared into the sky with catastrophic consequences, a court heard today. Two women fell to their deaths and others were injured when the giant PVC sculpture, hit by a gust of wind, became airborne as members of the public relaxed on a hot summer’s afternoon at a popular park in Chester-le-Street, County Durham. Maurice Agis, the 77-year-old artist who designed and supervised the multi-coloured Dreamspace installation, is accused of manslaughter by gross negligence over an alleged litany of safety failings. Read the article by Andrew Norfolk in the Times here. 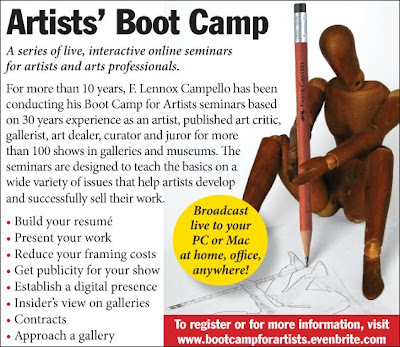 I'm going to be doing a couple of free radio podcasts tonight and tomorrow night at 7PM talking about some of the issues from the Artists' Boot Camp Webminars and answering questions. Click on the image below for details and to sign up for these two free webminars. I'm jurying and curating nearly a dozen shows this year, but I wanted to let you know about this very special one that I will be jurying for The Fine Arts League of Cary in North Carolina. Deadline is March 27, 2009 (postmark). The Fine Arts League of Cary is seeking entries for its 15th Annual Juried Art Exhibition to be held from May 8th to June 27th, 2009 in Cary/Raleigh, NC. Show awards and purchase awards will total over $5,000. Entries can only be mailed via CD. The postmark deadline for the mail-in registration is March 27, 2009. Wanna go drawing tonight in Vienna, VA? The Soundry's figure drawing open studio with a live model is tonight from 8pm-11pm. To register and ensure your spot, please call The Soundry at 703-698-0088. Cost for non-members is $15. They will have a large table or two in the room and a few drawing boards but feel free to bring your own easel if you prefer. Also, absolutely no cell phones, cameras, or any recording devices allowed in the studio. Must be 18 years or older to attend.